At this point I think it’s fairly well known that the Cars movie series continues not because of any artistic desire on the part of Disney/Pixar, but because the toys the films generate sell like hotcakes. Indeed, that situation hasn’t necessarily changed with this third instalment: apparently Cars 3 features 65 different individual racers, more than both the previous films combined. And several of those appear kitted out in different paint jobs. Disney gotsta make that toy money! The disregard with which they hold the actual movies is perhaps demonstrated by the fact this third one is helmed by a first-time director, Brian Fee, whose previous credits are as a storyboard artist on a couple of Pixar productions. Maybe they lucked out, then — or maybe they actually knew what they were doing promoting him — because I think this is easily the best film in the Cars trilogy. Although I wouldn’t say sports movies are my bag, I think Cars 3 probably benefits from taking a more clean approach to that genre, ditching all the spy hijinks distractions of the last one. That purity of genre keeps it straightforward and focused. It also re-centres itself on Lightning McQueen, shoving Mater (Larry the Cable Guy) back into a cameo-sized supporting role, which is about where he belongs (I wouldn’t say he’s likeable in small doses, but he’s tolerable). It still finds room for humour and levity, just in a more natural, less goofy way. Around that, it actually takes a run at some weighty themes — specifically, old age and obsolescence — and carries through on them too, with a finale that goes for more of a “finding worth in what you do next” ending rather than a “still got it (for now)” one. Such maturity means it’s perhaps more suited to Pixar’s grown-up fans than their young ones — it’s a surprisingly serious movie, in fact, without being po-faced about it. That said, you could probably play down the thematic stuff and just be entertained: there are still good set pieces, both action-based and comical, to keep the right family-friendly tone. It makes for a winning combination. Cars 3 may not trouble the upper echelons of Pixar’s greatest achievements, but it is the best of their Cars movies — the first of the trilogy I remember genuinely enjoying, rather than just finding tolerably okay. That might sound like a low bar to set, but Cars 3 clears it admirably. Cars 3 is available on Sky Cinema from today. When clownfish Nemo is netted by a diver, his nervous father swims across the ocean in search of his son. Meanwhile, Nemo tries to escape the fish tank he’s wound up in. Single dad Marlin just wants the best for his son, Nemo, but his worries make him overprotective. However, little Nemo is braver and more capable than he knows. It must run in the family, because Marlin steps up to go to the ends of the Earth to rescue his son, aided by the forgetful but kind-hearted Dory. Marlin and Dory meet a ‘friendly’ shark, Bruce, who coerces them into attending a meeting of his support group for sharks who are trying to reform from their fish-eating ways. “Fish are friends, not food”… until a shark smells blood, anyway. 13 years later, the gang got back together for Finding Dory. 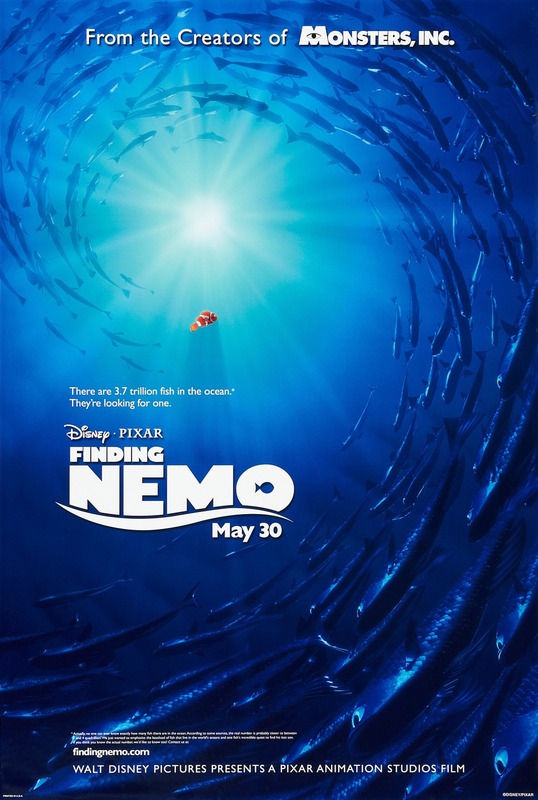 Finding Nemo is one of the films that helped establish Pixar’s name as a byword for quality animation. While it’s a very likeable movie, I must admit I’ve never loved it. Perhaps its popularity and impact has more to do with when it was released: Disney’s primary movies at the time were mired in the likes of Treasure Planet and Home on the Range, and DreamWorks’ only real achievement was the first Shrek. That said, I don’t want to do Nemo a disservice: it’s packed to the gills with engaging characters, memorable lines, funny ideas, colourful designs, and a couple of strong moral messages. It’s a true family movie. Once upon a time, Pixar could do no wrong. Then Cars happened; and worse, its sequel. Now, their movies remain an event, and some people still swear by everything they do, but I think there’s a greater awareness that they’re fallible. When it came out at the tail end of 2015, The Good Dinosaur was received as further evidence of that. Especially coming in the same year that gave us the universally praised (*coughoverratedcough*) Inside Out, it was instantaneously dubbed a “lesser Pixar”. But here is where completism has its merits, because I really enjoyed it. Set in an alternate world where the dinosaurs were never wiped out and so have evolved to the point where they talk, farm, etc, the film tells the story of little Arlo, an Apatosaurus who’s regularly overshadowed by his siblings. When an accident leaves him stranded many miles from his family he must make the long trek home, finding his inner courage on the way ‘n’ that kind of thing. There’s no denying that The Good Dinosaur contains an abundance of re-heated elements: there are multiple plot beats shared with The Land Before Time, not to mention the general “talking child dinosaurs” thing; a major inciting incident is taken from The Lion King; the episodic structure is reminiscent of The Jungle Book; animated dinosaurs on photo-real backgrounds recalls Dinosaur; and the moral message and main character arc are lifted from any number of children’s animations. While I did find this bothersome at first — especially as the worst offenders are concentrated in the saccharine first act — by the time the film had settled into its meandering middle I came to quite like it. Pixar have on several occasions produced films with an innovative opening act that descends into derivative kids’ animation runaround territory. WALL-E and Up are the worst offenders for this; Inside Out does it too, though there’s more of a mix of the two throughout the film. For many critics and viewers, the quality of those openings seem to be enough to earn the films heaps of praise. The Good Dinosaur inverts the formula: the easy, overfamiliar material is at the start, while the more meditative, mature content comes later. Clearly this didn’t work for many viewers, so I guess the lesson for Pixar is to put the clever stuff up front if they want universal praise. Instead, The Good Dinosaur was often dismissed as only being for very young children. Some bits do come over that way, but it has quite a harsh edge at times, and the scene where the heroes get high on rotten fermented fruit is freaky even for adults (or this adult, at any rate). It’s a bit of a tonal oddity in this respect, especially when you also factor in some of the leisurely, silent moments spent admiring nature that evoke a filmmaker like Terrence Malick. No, seriously. That’s helped by the animation being mind-blowingly good. Not so much the character animation (which is still strong — the character models are more detailed than you first suspect), but the scenery those characters are placed in… wow. If you didn’t know better I’m sure much of it could pass for photography. And the way they’ve achieved water, a notoriously hard thing to capture in CGI, is absolutely incredible. Perhaps most powerful of all is the relationship it creates between Arlo and a young human child he befriends, Spot. With humanity in a much earlier state of evolution, Spot is basically characterised as a dog — the way he moves, comes to his name, follows scents, shakes, scratches and enjoys being scratched, and so on — so of course I warmed to him. Nonetheless, though the building blocks used to create their friendship are very familiar, the way the film sells its emotional arc is ultimately immensely effective. Its resolution may even bring a tear to the eye. While it may take a while to warm up, The Good Dinosaur is ultimately a very affecting entry in Pixar’s canon. It’s by no means a perfect movie, but I do think it’s an underrated one. And, in all honesty, I enjoyed it more than Inside Out. After public opinion forced superheroes into a civilian relocation programme, Bob and Helen Parr — formerly Mr Incredible and Elastigirl — live a quiet domestic life with their three children. Bob is dissatisfied, however, and easily tempted back to heroic ways by a call to defeat an evil robot. When it emerges this is part of a plan to kill retired superheroes and give powers to everyone in the world, Bob’s wife and superpowered kids must enter the fray to save the world. The fantastic four titular heroes: Bob Parr, aka Mr Incredible, who has super strength and limited invulnerability; his wife Helen, aka Elastigirl, who can stretch her body like rubber; their daughter Violet, who can become invisible and generate a force shield; and her younger brother Dash, who has super-speed (name/power coincidencetastic!) There’s also their chum Lucius Best, aka Frozone, who can form ice from the air. He’s very cool, hence casting Samuel L. Jackson. Disillusioned superhero fanboy Buddy Pine, who grew up and used technology to give himself powers, dubbing himself Syndrome. Wants to give everyone in the world powers, because when everyone’s super, no one will be. Fashion designer Edna Mode, who makes the superheroes’ costumes. Inspired by Hollywood costume designer Edith Head, Bird wanted Lily Tomlin to voice her, and provided an example of how she should sound. Tomlin thought it was perfect, so she instead persuaded Bird to play the role himself. After tearing his old costume, Bob visits Edna for a new one. He wants a cape. Cue montage of why capes are a bad idea. The film presented a whole host of new technical challenges for Pixar, not least fully animating a whole cast of humans for the first time — they had to develop new technology to animate detailed anatomy, clothing, skin, and hair. The latter was a particular challenge. On Monsters, Inc., the animators persuaded director Pete Docter to give Boo pigtails to make her hair easier to animate, but Brad Bird accepted no such compromises, particularly as Violet’s long, face-covering hair was integral to her character — and it had to be depicted underwater and blowing in the wind, too. Ultimately, Violet’s hair was only successfully animated toward the end of production. One of the few Pixar sequels people actually wanted, The Incredibles 2 is in development for a 2019 release. That’s only a 15-year wait. “Most Disney films are about people meeting and falling in love. Incredibles is one of the only ones I can think of about how important marriage is. It shows a couple fighting, getting along, and working together.” — Rachel Wagner, Reviewing All 54 Disney Animated Films and More! Even before the present glut of big-screen super-heroics, Pixar were in on the game with this affectionate genre entry. Writer-director Brad Bird mixes together classical superhero antics with elements of 1960s spy-fi to create a retro world of optimistic heroics and larger-than-life villainy — at odds with the dark-and-serious tone of so many superhero movies of the past 17+ years, but all the more memorable for it. It’s also great at the kinds of things Pixar is known for. The combination means it transcends both the kids’ animation and superhero subgenres. #45 will be… keeping up with the Joneses.